Average Unit Cost is the listed unit price that you purchased your material at, averaged over all your expenses that you have created. This calculation is particularly good for quick direct unit price comparison when looking at different prices from different suppliers. Average Actual Cost is the true average price of your materials, meaning that includes all discounts, shipping costs and tax amounts that you paid in purchasing the item. 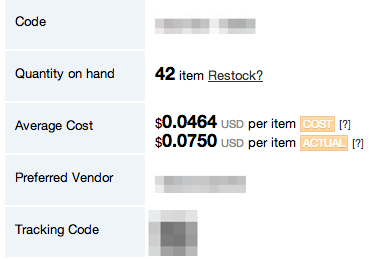 This can be used for price comparison on a more detailed level, as you might find that while Vendor A is cheaper with their published unit prices, their shipping fees makes their actual cost much higher than Vendor B which may have a slightly higher unit price. We have now switched all profitability calculations around Craftybase to use the new Average Actual Cost value rather than basic Average Unit Cost as as it factors in many of oft-forgotten “hidden costs” and is thus much better representing your true margins on your products - allowing you to be much more accurate and confident in setting your prices. How are the average costs for a Material calculated?